For those interested, it is 32 days until baseball season starts, and yours truly will be watching and hoping the SF Giants again have a fantastic season. Also, it is 41 days until the Just for Openers convention in Nashville. I have been stockpiling beer openers for Tipped Worm Johnny, and I have no doubt he will have some corkscrews for trade. And, of course, the JFO has become the annual hunting trip with Tommy. I am sure we will be canvassing Tennessee with hopes of unearthing a collection (or at least a couple of good finds). Not that Tommy hasn’t been making his own great finds as of late. News hasn’t hit his blog yet, but it seems our man TC hit the motherlode recently. I can hardly wait for pictures! And, it is only 75 days (or 108,000 minutes) until Brimfield. I responded requesting pictures and such, but then revisited the email, and decided to call the phone number that was provided. It seems that the person that came across the U-Neek, doesn’t have access to a digital camera, and had a family member send the email on their behalf. We talked for a bit about how he came to know what the U-Neek was, prices online, rarity of the item, etc., I suggested to him that if he wanted to get that kind of price, that he should throw it on eBay and watch the dollars pour in. He wondered aloud, what I would be interested in buying the U-Neek for. I thought about it for a moment, and told him that I already have one, but if I was going to make an offer, it would be for a bit less than he could get on eBay. Given that he doesn’t do eBay, and my offer was pretty darn fair, he agreed to the price. Of course, I still haven’t seen pictures yet, but he assured me that it looks like it has never been used, and that all the pieces are there. 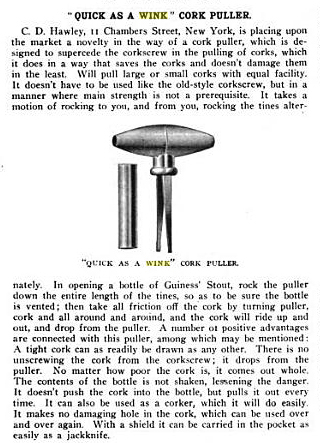 So…just going off his description, I negotiated to buy (to this point) an invisible 1917 Brady patent U-Neek Cork Puller. Of the various options we discussed for payment, he suggested that we do it COD or Cash on Delivery. Does the post office even still do that? We discussed alternative options, and I explained that I would head down to our local post office, and see if this was indeed still an option. As is happens, our post master was at the desk, and said that she was just having a discussion with someone recently about the same topic. Not the U-Neek mind you, but the outdated nature of Cash on Delivery. Further, what makes this an odd way to make an exchange, is that the cash needs to be given upon receipt of the package, not opening the package and approving of its contents. That all said, if you have an antique corkscrew (invisible or not) I have a very visible pile of cash waiting and ready. One, or a collection, drop me a line, as I am ALWAYS buying (or trading, and very often using antique and vintage corkscrews). Over the past few days, construction has slowed somewhat, as I have had a wicked cough, and hopefully will feel a bit better tomorrow. Still, the final coat of mud is on the walls, the doors will be installed soon, and the lovely and I picked up the bathroom floor tile on the mainland yesterday—and, a new wet saw… I love getting new tools! Soon enough we will be installing the flooring and fixtures, and shortly after that it will actually resemble a master bedroom–well, I also am going to be designing and building the bed too–so perhaps it won’t be shortly. Still, progress is being made! On a corkscrew note, I ran across an interesting bar-tool/corkscrew the other day, and managed to pick it up rather inexpensively. I knew I had seen one before, but couldn’t remember the patent/registration. So, after securing the deal, I opened up Ferd’s DRGM book, and found the same piece on page 63. 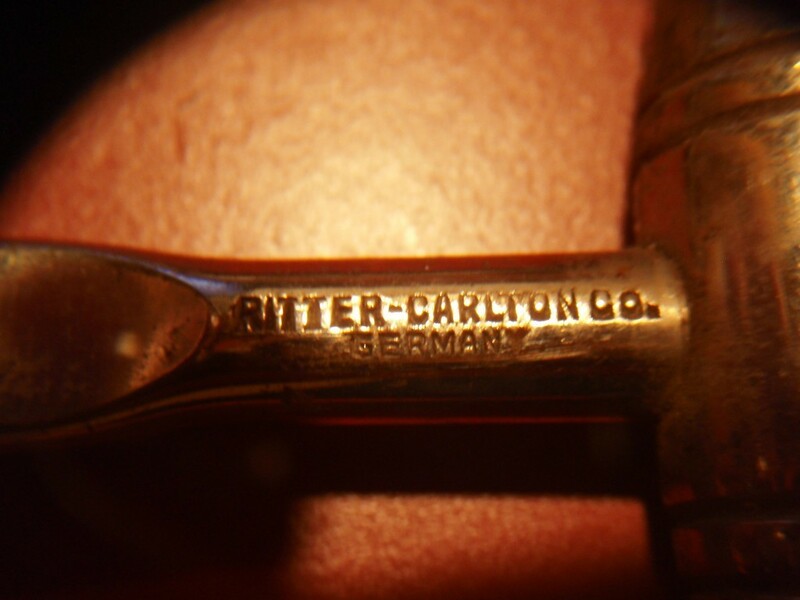 A 1934 George Hermann Usbeck registration, it is marked RITTER-CARLTON Co. GERMANY. This one might be staying in the collection, but of course, I am aways open to a trade. Eight years ago, I purchased a corkscrew on ebay that was advertised as a corkscrew / ring / tamper. And, after receiving the corkscrew, I went to remove the sheath only to find it glued together–well, kind of glued together as the glue didn’t hold. 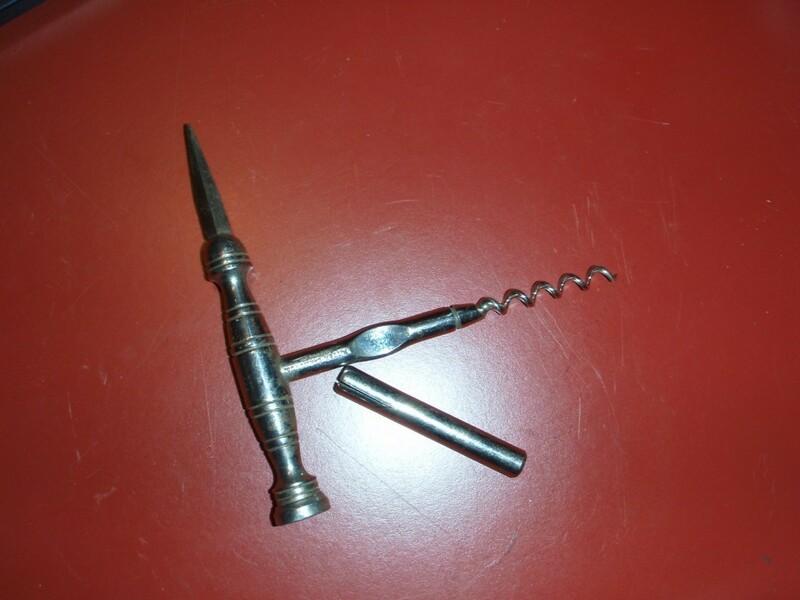 When I emailed the seller, asking as to why he advertised it as a corkscrew when there was no corkscrew present. 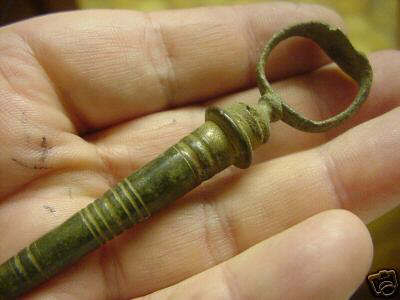 He explained that, “…nearly everyone” on eBay UK was a detectorist, and that these were dug items, and dug items rust. Not the most pleasant of interactions as the seller was appalled that I was unhappy with my glued-together-rusted-corkscrew-less-corkscrew, however, eventually he reluctantly refunded my paypal. 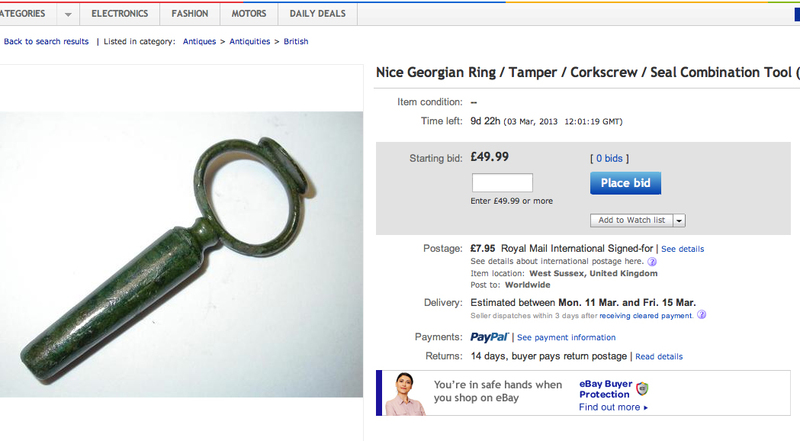 Yesterday, it seems there is a return of the detectorists, as a Nice Georgian Ring / Tamper / Corkscrew / Seal Combination Tool was listed. Could the corkscrew have survived being lost, buried, detectorist-ed, and excavated? 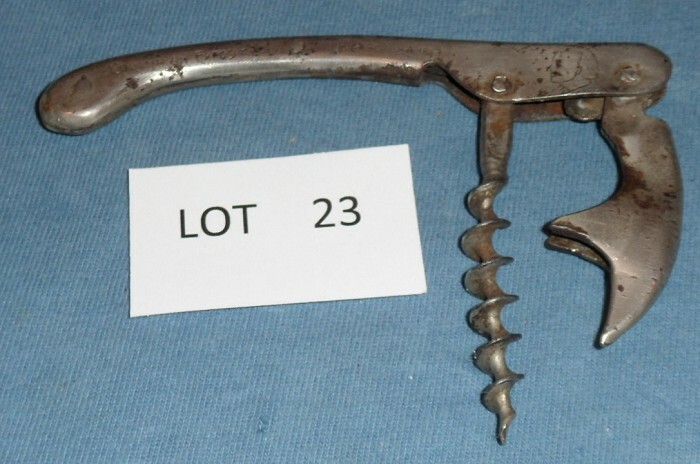 Is the corkscrew worth a bid? adding to the lovely bride’s best 6! The lovely bride and I got an early start yesterday, and started heading back home from NYC. With only a little snow falling, we chose the most direct route, and headed up through NY, CT, MA, NH, and finally to Maine where we hopped on the boat. And, while the snow was cleared from the sidewalks, we are back to having snow and high winds today. Springtime cannot, I repeat CANNOT, come soon enough! While in NYC, I didn’t find any corkscrews, although I certainly used a couple of them multiple times! Also amongst the packages was the Ivory “CASTSTEEL” corkscrew. 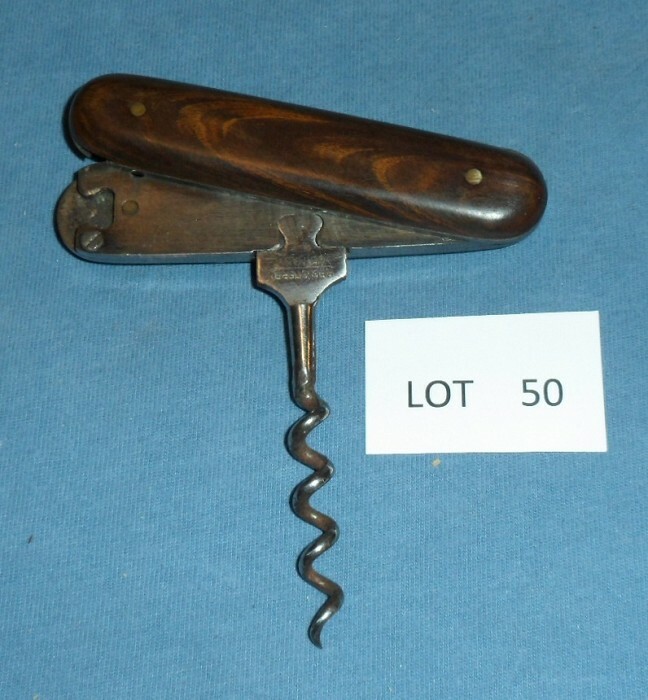 It is indeed a handsome corkscrew which will remain in the collection. As far as the continuing renovation on the house, we will be back at it tomorrow! A couple of days ago, knowing that the blizzard known as Nemo was going to hit the East Coast, the lovely bride and I hopped on the boat, and tried to get some miles behind us, on our way to NYC. And, we did. We made it over to the mainland, and headed to Portsmouth where we held up for the night, and awoke to piles of snow (and very high winds) everywhere and driving bans in Massachusetts and Connecticut–both of which would stand in our way of getting to the city. After talking it over, we figured…what the heck, let’s hop in the SUV, put it in 4WD, and head West out of the storm, and across New Hampshire and Vermont, where we could start heading South to NY. At times it was a little unnerving being the only car on the road, and there were times where the snow was pretty thick, visibility poor, and wind howling, but over the hours we would see a few more cars, the winds subsiding, and finally blue skies on the horizon. We made it out of the storm just as we were departing NH, and entering VT. And, shortly after that found ourselves in Troy, NY (unfortunately, there were no corkscrews at the antique mall that we visited in Troy). From Troy, we hopped on the 9 and headed south, ultimately making it into the Hudson Valley, where we grabbed dinner and a hotel room. The next morning (yesterday) we hopped back in the car, and cruised in to Manhattan with no issues whatsoever. 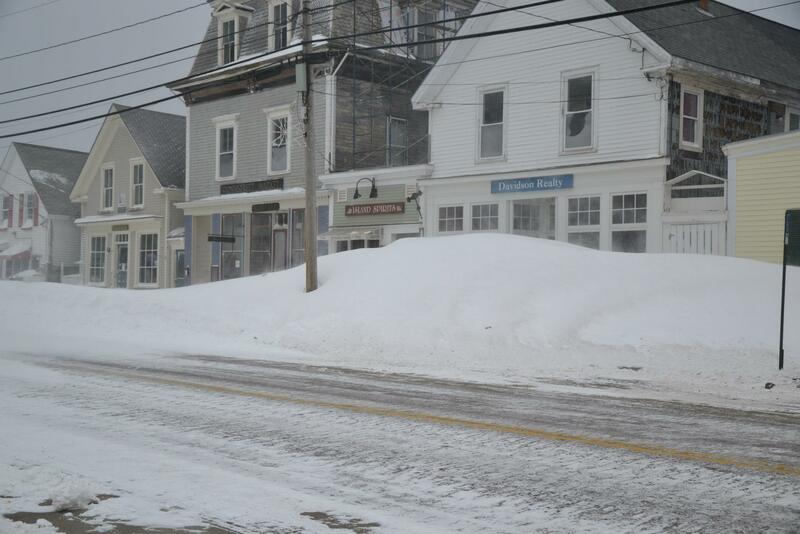 Throughout the snowy adventure there had been updates from friends, and a few photos appearing online of how the blizzard was affecting Vinalhaven. Here is the front of the wine shop! After requesting a picture of the marking, with hopes of trying to discern who the maker might be, the seller explained they would post one to the auction, and in short order there was an additional photo. And, shortly after that, a bid. When we arrived in NYC, I needed to do a little work, so I went online only to see that the auction had been ended. 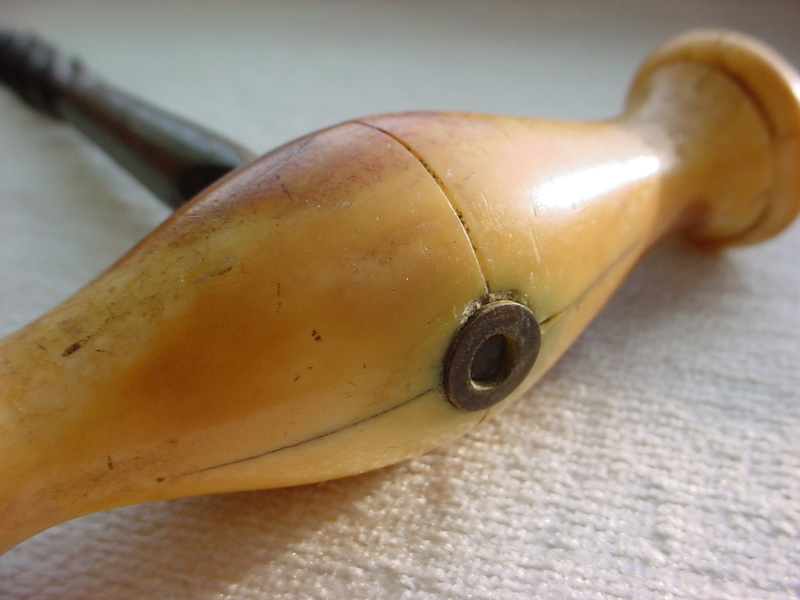 After delving a little deeper, I came to learn that the corkscrew had been removed from eBay due to the fact that it was an “Ivory” handled corkscrew. Having already exchanged emails with the seller, or the former seller as it were, we discussed the issue of a prohibited item on eBay, and so forth. After which, she emailed with a very generous offer. I thanked for her generosity, and asked if she was really sure she wanted to do that. And, she asked for my address, has packaged it up, and apparently it’s on its way to the island. After I get back home, I will see if I can’t find a way to compensate the former-seller-now-gifter. 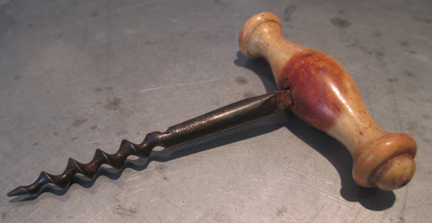 Of course, the unusual marking reminded me of a similar looking corkscrew that I had picked up a couple of years ago. 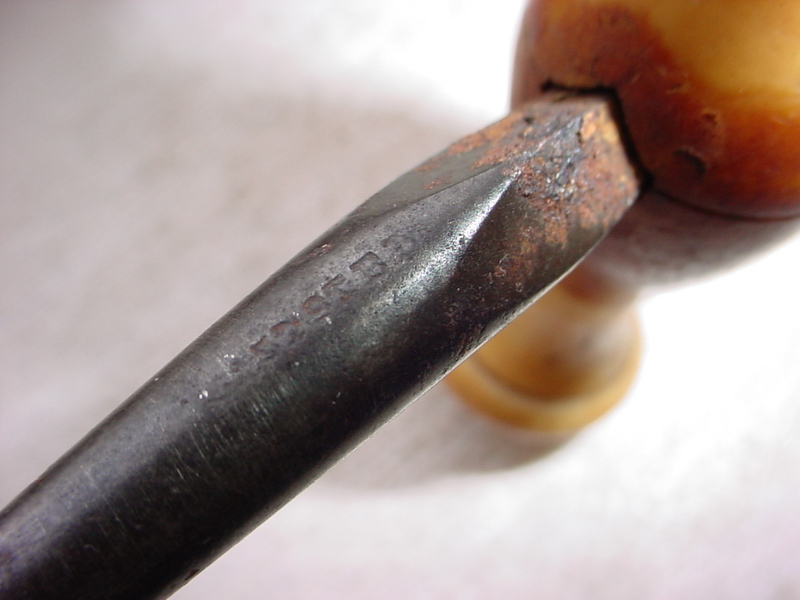 That one was described as having a marking of “G 5 Spell” After receiving that one, and discussing with with G.I., we agreed that it was probably a “CASTSTEEL” marked piece, which would also mean it was a Humason & Beckley corkscrew. 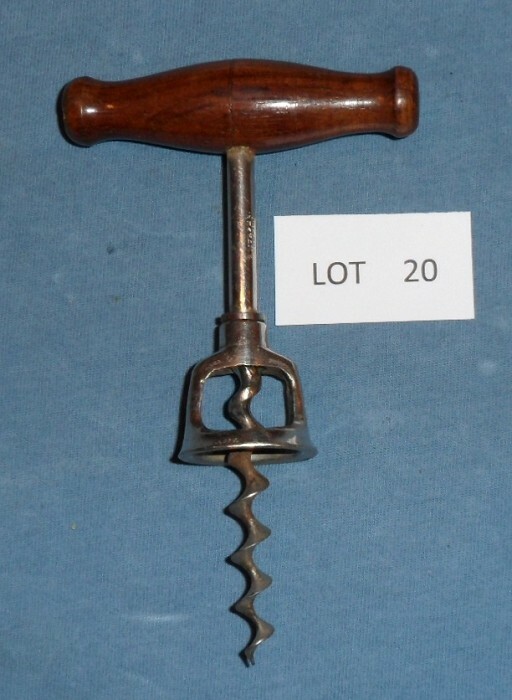 A very special thank you goes out to the giver of the corkscrew, that was amazing that you wanted to do that, and it will be going to a very good home. Not to mention it makes for a good story that I will share with my collecting (and non-corkscrew-collecting friends). I have added a Converse page to the website. Check it out! The lovely and I are heading to NYC for a week, so blogging will be intermittent. Perhaps a corkscrew will be found along the way (surely buried in the 2 feet of snow that is supposed to start falling any minute). Yesterday, shortly after posting the blog, I received an email from DB with a photo attached. After doing a little research, it seems that the Holihan Bros. (James P., Joseph P., and Charles A.) 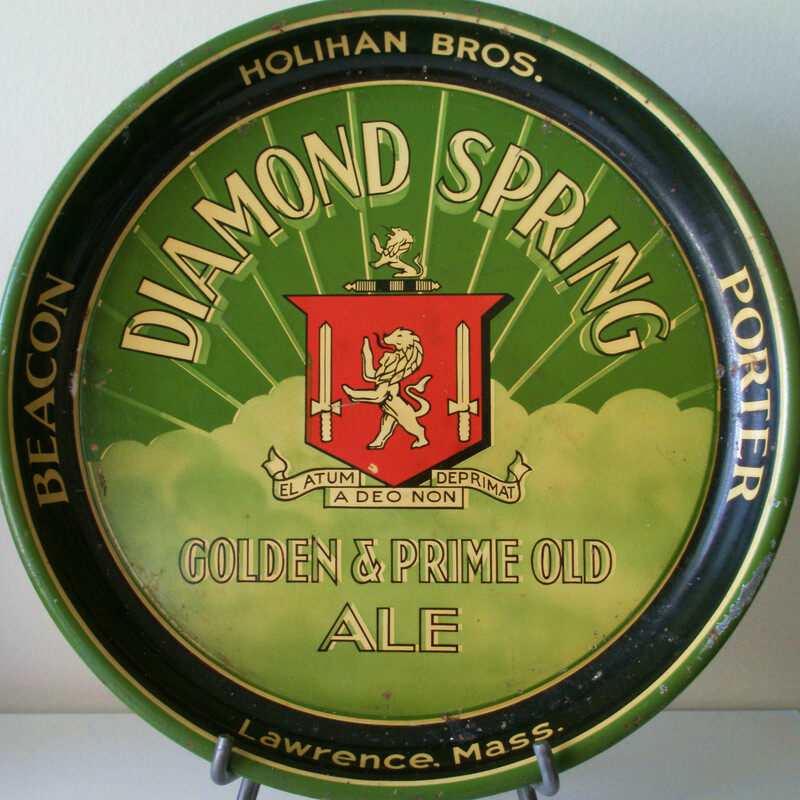 not only were the “wholesalers to the people,” they were also brewers to the people, producing Diamond Spring Beers! Thanks for the email Don!!! One more for the list. Many years ago, whilst visiting an estate sale in Chicago, I found an 1899 Maschil Converse prong puller in a tool box in the basement of the house being cleared out. And, after asking how much the folk conducting sale wanted for it, the brother of person whose items were up for sale, told me to just put it in my pocket, and have a good day. It was free. And, given this was early on in my collecting, it was the first Converse I had ever owned. And with a price of FREE!, I was pretty excited. 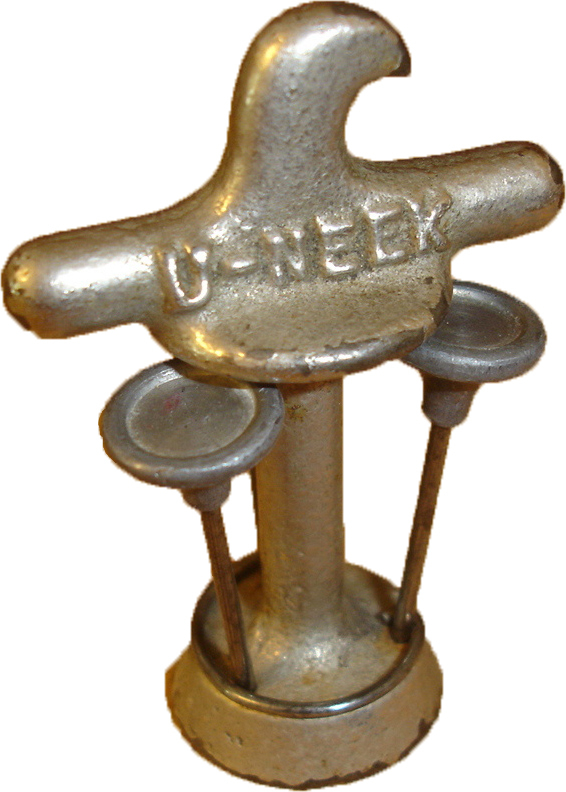 I still have that Converse cork puller, and sits along side several others (okay, more than several). Which brings me to an interesting project. Over the years, I have found many other Converse cork pullers, several with advertising on the sheath, and I began to wonder how many different companies used the Converse as a vehicle to advertise. 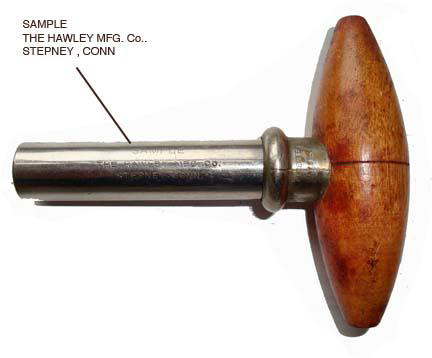 The Hawley sample is an interesting one as in various publications, they mention Hawley Manufacturing as making cork pullers. And, this advertisement appeared in the October 13, 1910 issue of The National Tribune. Clearly Hawley was one of the manufacturers of the Converse patent. And, whether their cork puller was indeed the “slickest thing out,” or whether “Men and women buy instantly.” They certainly do turn up with plain sheaths, advertising sheaths, and on rare occasions in Sterling. So, this brings me to all of you. Let’s put together a list of known Converse advertisements. How many variations are out there? 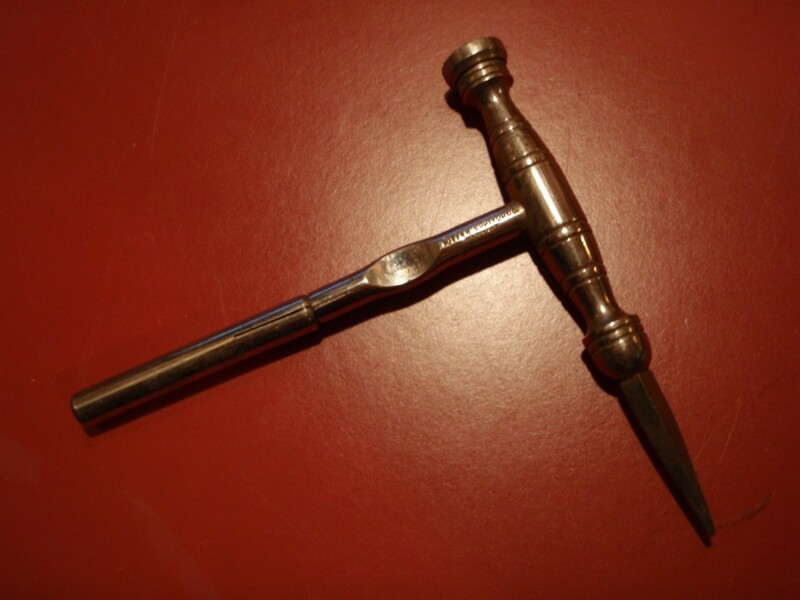 And, are there any other “Samples” out there like the Hawley marked cork puller. Drop me a line at Josef@vintagecorkscrews.com and let the Converse-ation begin. I will gladly swap corkscrews / cork pullers if you have a different variation. The ICCAuction ended yesterday, and while I was shut out on the Hoegger wallmount corkscrews that MW had put up for auction, I did win three lots. 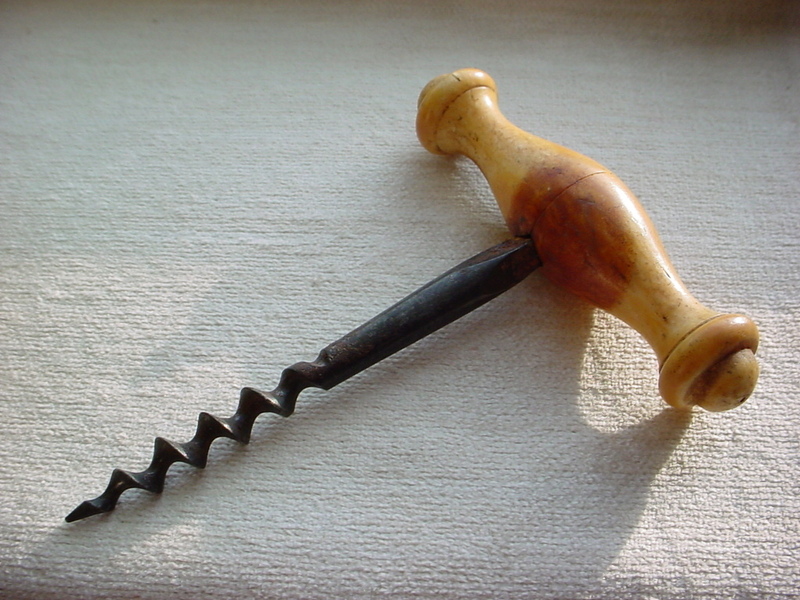 The first, is a Murphy corkscrew—while a relatively plain looking Murphy, this one has a handle that is different than the one already in the collection. A slight variation, marked R. Murphy Boston on the shaft, how could I not add it to the collection. This one is cool as it is a souvenir from the Columbian Exposition of 1893! The last is an 1909 Edward Zinn patent, I used to own a similar example–that I found 4 years ago–but sold it off to JM as he was hot for it. 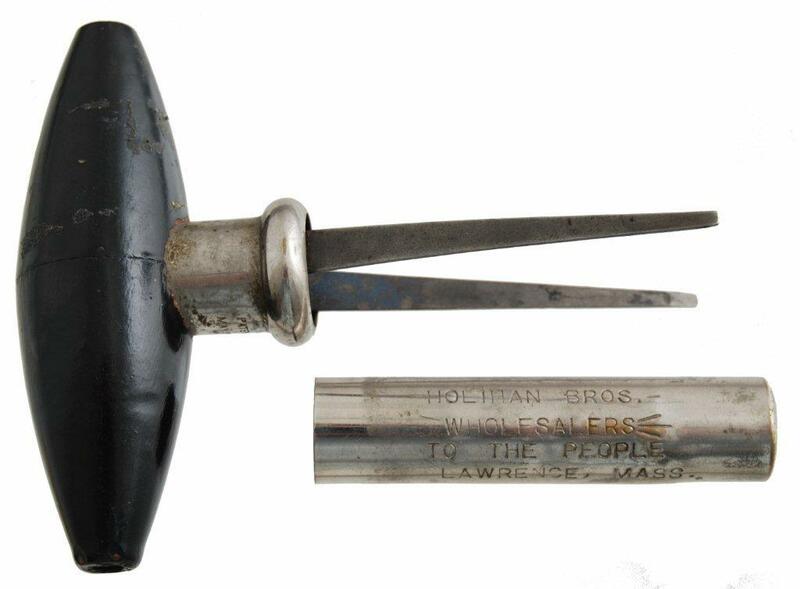 When you run across one of these—marked on the tools Edward Zinn–open the case where you can insert the tools, on the inside of the handle, where it slides open, there is actually a patent number; 941,901. Well, sometimes there is a patent number. 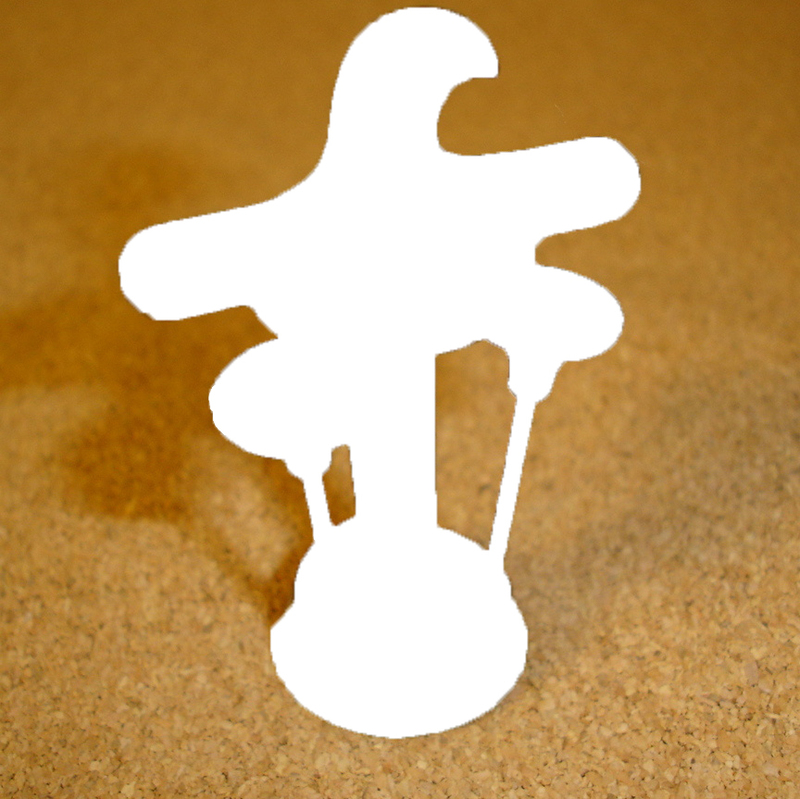 A hard to find corkscrew! And, it is nice to have an example back in the collection!